Many research models such as knock-out mice and patient sample often provide miniscule sample volume for detection. detection and comparison of 40 obesity biomarkers. Easy to use. Save time by measuring up to 80 biomarkers simultaneously. Versatile Measure human serum, plasma, CSF, tissue extract and more! 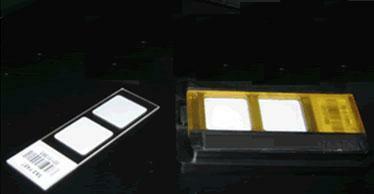 Each slide contains 2 nitrocellulose pads (or wells). One pad can have 40 capture antibodies in addition to 38 positive control spots and 2 negative control spots. The fluorescent images of plasma derived from two individuals using Phoenix Pharmaceuticals biomarker chip (OC-KF-002). Increased levels of Amylin, GLP-1, Glucagon, and Leptin can be observed from the obese individual (left panel). On the contrary, increased levels of Adiponectin, Ghrelin and GHRF were found in the non-obese individual. This image was collected using GenePix 4100A by Axon Instruments, Inc. The average duplicated spot intensities for each subject were analyzed to reveal the over- and under- abundant plasma biomarkers in the obese individual (delete) compared to the lean individual.